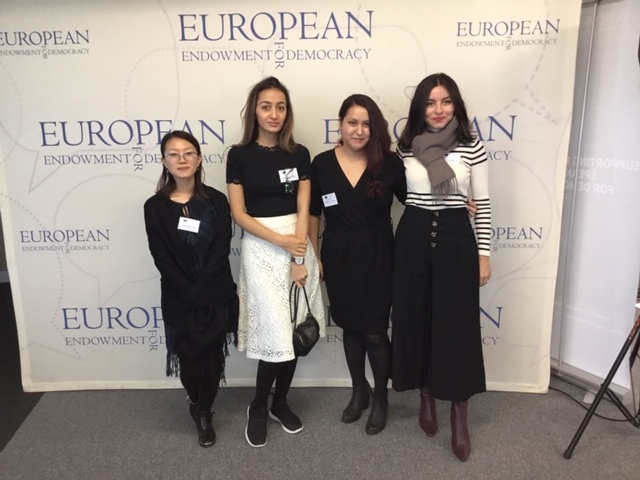 EUCAM's former and current fellows (from left to right): Anastasiya Ten, Sabrinisso Valdosh, Sevara Khamidova and Nushofarin Noziri. 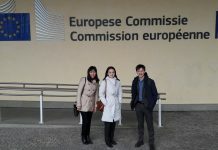 In mid-November Anastasiya Ten and Sabrinisso Valdosh travelled to Brussels with EUCAM coordinator Jos Boonstra for several meetings organised by Andreas Marazis of the European Neighbourhood Council. 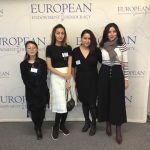 They also attended a conference on 15 November organised by the EUSR for Central Asia and the European Endowment for Democracy (EED) on ‘Strengthening civil society in Central Asia’. 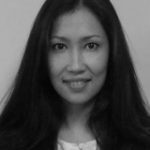 EUCAM produced a discussion paper for the gathering of Central Asian civil society representatives and EU officials. Former EUCAM fellows Nushofarin Noziri and Sevara Khamidova had also been invited by the conference organisers. 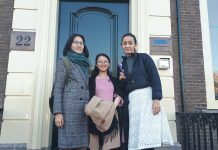 The next day current and former EUCAM fellows participated with other Central Asian participants in a training organised by the EUSR and EED. 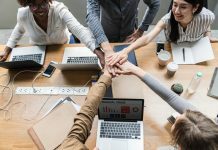 By the way, EUCAM Fellowship programme is open for new applications. Click here to learn more. The deadline is December 3, 2018.